Queen Latifah comes out of the closet, rushes back in, then comes out, takes a peek, looks around, and rushes back in again. Grrrl, you should put a revolving door on your closet! Everyone knows you recently bought a house with your "fitness trainer" Jeanette Jenkins, and that ain't no speculation. Upscale: You’ve been asked so much about your sexuality. Wouldn’t it be easier at this point to just speak on it-once-and be done with it? 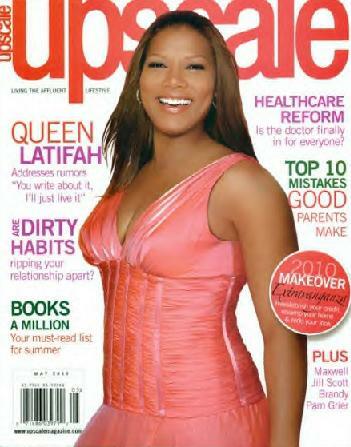 Queen Latifah: I don’t have to explain anything. I don’t have to confirm anything. Look, I need my time. I need my life. Upscale: But isn’t that a part of being a celebrity, letting people into your personal life? Queen Latifah: You know, I was looking at something the other day. A magazine with Jennifer Aniston on the cover. That’s a strong woman right there. All of these people in her business — who is she dating? Angie this. Brad that. They come up with so much stuff. That’s a tough situation to be in. My situation is small compared to that. But still, I don’t feel like I need to explain. I’m the one living it. You write about it. You go ahead and speculate. I’ll just live it.